To ensure that LML can measure all micro-parts which are produced, the company’s manufacturing facility houses a range of measurement equipment. 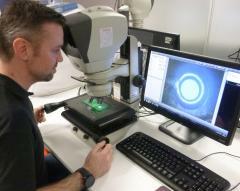 This collection of high specification metrology tools includes a Swift Duo microscope purchased from us. The Swift Duo is calibrated to a UKAS standard which provides a certified validation for the measurements made on the system. The micro-features need to be measured accurately, repeatably and easily, with the added requirement that the measurement data can be recorded and shared easily - the Swift Duo does all of these things. One of the key USPs for LML’s services is fast turnaround and this is made possible by having all of the necessary laser and metrology equipment on site and fully functioning at all times. In the case of the Swift Duo system, regular support from us ensures that this is the case and that LML gains the maximum benefit from the wide range of features which the Swift Duo provides for diverse measurement requirements. We work closely with LML to ensure that we can understand LML’s needs and hence provide the appropriate metrology solutions for LML’s evolving requirements. The purchase of the Swift Duo was the result of a close dialogue and the regular interactions have continued; we provide continual, pro-active support, which is of great benefit to small, dynamic companies like LML.